Billy, Paddy, Archie and Sam are best friends since childhood. When Billy finally proposes to his very young girlfriend, he invites them all to join him in Las Vegas and forget about their old age and relive their glory days. While preparing the bachelor party they realise that old wounds haven’t yet been healed in all these years. With such a star cast you could assume that this would never go wrong. And indeed, “Last Vegas” is a funny and entertaining feel-good movie . It has some real funny moments that makes you laugh, but has to rely on the humorous one-liners and sometimes hilarious situations. Once again finally straightforward humor. No absurd situations or vulgar nonsense. 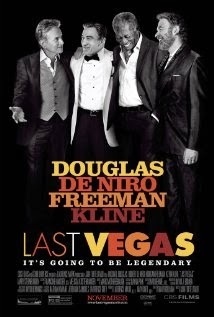 A gang of retired men organizing a bachelor party in Las Vegas, with all the obvious consequences. Robert De Niro, Morgan Freeman, Michael Douglas and Kevin Kline are 4 top actors and already for a long time famous in Hollywood. And once again they show what they are capable off and that they can handle any movie genre. Ok, it’s sometimes corny and hugely predictable. The fact that Kline didn’t need the blue pill, you saw that coming a mile away. But they do it in such a natural way and apparently it looks like they enjoyed to play in this movie. The complications that occurred were not that original. That each of them had difficulties as a result of their old age was to be expected . Kline is in a stage where he sees himself surrounded with even older people than himself . The opening scene in the pool was already an indication of what level the film would be. They used a few thigh-slappers here but thanks to Klines facial expressions and intonation they turned out perfectly and were absolutely hilarious. Freeman had a mild heart attack and is pampered in an exaggerating manner by his son. He’s only permitted to sit in front of the television and meticulously take his pills. De Niro is languishing in his apartment after the death of the love of his life, and only gets occasionally a visit from his neighbor who brings him her soup (unforgettable conversation between these two). The only well conserved one is Douglas and he’s about to marry a much younger person , which in turn leads to teasing witticisms of the three closest friends. Together they formed “The Flatbush Four” and they are best friends for 60 years already. A friendship that was disturbed by a misunderstanding, which is going to be resolved in the end. Morgan Freeman surprised me the most as Archie with his witty remarks. My favorite scene is the one where they are in the nightclub and enjoy a Vodka Red Bull amongst younger people. The way Freeman explains how he’s getting drunk and still feels as if he is full of energy, is sublime. I have played this scene repeatedly because I think it’s a strong piece of acting and seeing the reactions of the other guys, it seems to me there was a lot of improvisation by Freeman. It seemed like a really comical gathering among good friends . I’m glad I haven’t seen the trailer because apparently there were a lot of the most funny moments in it. “Last Vegas” is a comic drama that really wants to show what eternal friendship really means and how seniors can still enjoy a bit of fun. No Oscars will be awarded for this picture, but it gets a personal nomination from me as best comedy of all the comedies I saw lately. And I hope that I have such vitality and joy of life like these old timers, when I reach the same blessed age .